SkinCure. Inc., a natural cosmetic company( CEO – Myeong Ok Kim ) attended “Aesthetics Asia 2013”, one of the best aesthetic conference exhibition in Asia, from 12th to 14th September 2013. The fifth Aesthetics Asia held in Singapore is leading fair focusing on plastic surgery, beauty equipment industry. Including the United States and Europe, more than 30 countries, 120 companies participated in this exhibition. Plastic surgeons, dermatologists, dentists and directors of aesthetics and spa attended various meetings and conferences. 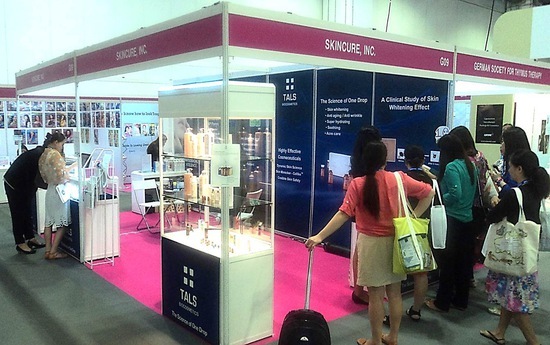 In this exhibition held at Marina Bay Sands in Singapore, SkinCure introduced TALS for professional use such as beauty salon and clinic. Based on the technology obtained by constant study of the skin mechanism, TALS is a cosmeceutical brand that helps you find healthy skin free from stressed-out skin with the safest and effective formula. Major products are Ampoules for professional use, spot control, Cellike lift firming cream. At that moment, SkinCure, operating of cGMP certified factory in Jeju, the cleanest area in Korea and matcing with global standard, had more than 50 of business meeting, about 40 companies of them are potential customer. In this regard, whitening products of TALS are the hottest thing among the dermatologists and directors of asesthetics in the south east Asia, and some of them wanted to a large purchase on the spot, Myeong Ok Kim, the CEO of SkinCure, said. Participating in Aesthetics Asia in Singapore, SkinCure take this opportunity as a stepping stone to dominate Asian market. After Aesthetics Asia, SkinCure will attend Beauty 13 Expo in Malaysia from 4th to 7 the October and Cosmoprof Hong Kong.